41 Fairfield Place, West Caldwell, NJ 07006, U.S.A.
Merrimac Industries designs, manufactures and assembles enhanced, customized state-of-the-art microtechnology and RF microwave components, sub-assemblies and integrated modules for the worldwide defense, satellite and wireless communications sectors. And, as an ISO 9000 Certified company, Merrimac is committed to not only meeting but exceeding the rigorous quality and reliability expectations of its diversified customers through consistently providing them with Total Integrated Packaging Solutions. Over the years, Merrimac has dedicated itself to provide increasing levels of value to our customers in High Power and Large Signal Integration, as well as High Performance mission-critical integrated solutions combining both our conventional and Multi-Mix® process technologies. The patented Multi-Mix® Resource Module is a powerful addition to Merrimac’s existing product portfolio of integrated subsystems based upon Multi-Mix® technology. Multi-Mix® Microtechnology is a new innovative process for microwave, multilayer integrated circuits and micro-multifunction modules (MMFM®). This process is based on fluoropolymer composite substrates, which are bonded together into a multilayer structure using a fusion bonding process. The fusion process provides a homogeneous dielectric medium for superior electrical performance at microwave frequencies. The bonded multilayers, with embedded semiconductor devices, MMICs, etched resistors, circuit patterns and plated-through via holes, form a surface mount module which requires no further packaging. In fact, the MMFM® structure becomes the package. This small outline, low-profile structure is lightweight, and the surface-mount format is compatible with microstrip or coplanar waveguide. The process controls of the Multi-Mix® methods allow a low cost manufacturing approach that is suitable for high or low volume production. The platform strategy of MMFM® reduces engineering cycle time and enables the Multi-Mix® process to be an economical solution for new designs. 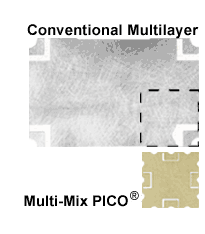 Multi-Mix PICO® is the next big leap for Multi-Mix technology. Multi-Mix PICO® reduces the size of single-function microwave components from 84% to 87% compared to the previous Multi-Mix designs, which were until now the smallest in the industry. Merrimac accomplishes this without sacrificing performance. Multi-Mix PICO® provides the highest power handling ability in the smallest footprint and overall size, and at the lowest cost of any other multilayer construction. Orders of magnitude reduction in size and cost provide greater value to our customers, which can be passed on to their customers. The product family has passed environmental screening including Thermal shock, Burn-in, Acceleration, Vibration, Mechanical Shock, Moisture Resistance, Resistance to Solder Heat, and Thermal Cycling Life Test (>1000 cycles). Multi-Mix® is a manufacturing process based on fluoropolymer composite substrates that are fusion bonded together into a multilayer structure. The fusion bonding process yields a homogeneous monolithic structure with superior performance at microwave and millimeter wave frequencies. The bonded multilayers can contain embedded semiconductors, MMICs, etched resistors, circuit patterns, and plated through vias to form a SMD module that requires no additional packaging and is suitable for automated assembly. Merrimac Industries, Inc. introduces Multi-Mix Zapper – its “next generation” of microwave components specially designed for use as direct drop-in replacements for conventional surface mount couplers and hybrids used in virtually all wireless base station designs. The Zapper Z-Series provides design flexibility that offers 45% higher power handling capability and twice the reliability of competitive products their size, but at a fraction of the cost. Merrimac has developed a space qualified products program where we are able to provide high reliability components and subsystems and pass on the economies of scale and standardization by utilizing proven parts, materials and processes based on our 30+ years of satcom heritage. These product concepts reflect our core competencies, and can be custom designed and manufactured to meet your specific needs and requirements. Merrimac’s filters are manufactured using our patented Multi-Mix® multilayer fabrication process. This allows us to manufacture these parts in high quantities at lower costs. We use fusion-bonded stripline, which provides us with performance benefits at high frequencies. Passbands can be as narrow as 1%. The filters do not need to be tuned, which eliminates the filter-tuning step in production test, along with the external tuning circuits or tuning screws required by conventional designs. The FBGW Series are bandpass filters with unique properties that make them extremely well suited for applications in which extremely narrow bandwidths, small size, low insertion loss, moderate power levels, and easy intergration with other components, are critical. The FBGW Series represents the first commercial production of filters that combine extremely narrow bandwiths with exceptionally small size in a planar, multilayer structure. Merrimac’s FBGC Series combline filters allow very wide stopband rejection to be achieved in very small enclosures without the appearance of reentrant spurious passbands. In addition, they require no tuning once incoporated in a ciruit, making their already economical design even more cost-effective, especially in high-volume production. The FBGC Series filters incorporate all of the advantages provided by Merrimac’s patented Multi-Mix® multilayer fabrication process, and are an excellent choice for applications in which size and weight are critical. Merrimac’s FBGI-7.6GHz Series interdigital bandpass filters combline the features of Merrimac’s patented Multi-Mix® multilayer fabrication technology with the ability to operate to three times their center frequency without reentrant spurious passbands. They typically offer better overall performance than interdigital filters designed to the same specification with conventional filter fabrication techniques. Merrimac’s FBGI Series interdigital bandpass filters combline the features of Merrimac’s patented Multi-Mix® multilayer fabrication technology with the ability to operate to three times their center frequency without reentrant spurious passbands. They typically offer better overall performance than interdigital filters designed to the same specification with conventional filter fabrication techniques. Merrimac’s FBG Series hairpin resonator bandpass filters are designed in Merrimac’s patented Multi-Mix® planar, multilayer fabrication process. As a result, they have unique characteristics that make them well suited for applications in which size, weight, and cost are critical parameters. Merrimac’s FBKA Series millimeter-wave filters provide superior performance over conventional filter topologies, with center frequencies as high as 40 GHz. They are exptremely small, lightweight, and rugged, and can be qualified for spaceflight applications. In addition, they are low in cost and need no tuning, which makes them an excellent choice for high-volume production in LMDS and other millimeter-wave communications applications. The FBKA Series filters incorporate all of the advantages of Merrimac’s patented Multi-Mix® multilayer fabrication process, including superior electrical characteristics, extremely small size, and negligible part-to-part performance variation. 1) What type of interfaces are available for Multi-Mix®? 2) What quality testing has Multi-Mix® been subjected to? 3) How does the Multi-Mix® process deal with the issue of hermeticity? Substrate materials are hydrophobic, repelling moisture and high surface tension liquids. Substrate materials absorb low tension liquids. Hermetically packaged MMIC’s are embedded within the multilayer module. Non-hermetic MMIC’s, embedded within the multilayer module, have passed rigorous screening (above). 4) What is the coefficient of thermal expansion for the substrate materials used in Multi-Mix® technology? 5) How does the Multi-Mix® process dissipate unwanted heat? 6) What are the advantages of the process? C. Frequency (upper and lower limit)? 8) What type of resistors are used in the Multi-Mix® process?